This post is sponsored by Cost Plus World Market. I am a Cost Plus World Market Blogger Brand Ambassador and member of #WorldMarketTribe all opinions are my own. Earlier this year I got to have some major fun hosting workshops at the Cost Plus World Market Retail location in Brooklyn, New York, I hosted an Easter Treat Jars Workshop and a Children's Story Time Event in honor of National Library Month. (If you missed those click HERE to read up on it), one of the books I read was Llama Llama Red Pajama by Anna Dewdney and that set me off on a Llama obsession that is definitely carrying over to the holidays thanks to Cost Plus World Market! If you didn't get to attend one of the totally fun workshops at your nearest Cost Plus World Market, I have got a great reason for you to RUN not walk to your nearest location starting TODAY! To find your nearest store check out the store locator page HERE. 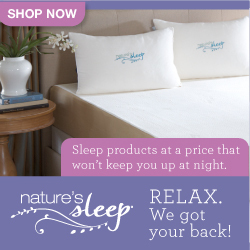 Ƹ̵̡Ӝ̵̨̄Ʒ - Every​ ​day​ ​beginning​ ​Wednesday,​ ​November​ ​1st​ ​through​ ​Wednesday,​ ​November 22nd,​ ​your​ ​local​ ​Cost​ ​Plus​ ​World​ ​Market​ ​store​ ​will​ ​hide​ ​5​ ​Golden​ ​Llama​ ​pieces throughout​ ​the​ ​store. Ƹ̵̡Ӝ̵̨̄Ʒ - Each​ ​day,​ ​we’ll​ ​share​ ​the​ ​daily​ ​clue​ ​in-store,​ ​via​ ​email​ ​and​ ​on​ ​our​ ​social​ ​media channels.​ ​Use​ ​the​ ​clue​ ​to​ ​help​ ​you​ ​find​ ​a​ ​Golden​ ​Llama​ ​and​ ​you​ ​could​ ​receive​ ​a reward. Ƹ̵̡Ӝ̵̨̄Ʒ - Locate​ ​(1)​ ​Golden​ ​Llama​ ​piece​ ​and​ ​bring​ ​it​ ​to​ ​the​ ​nearest​ ​store​ ​associate​ ​to exchange​ ​for​ ​a​ ​reward​ ​coupon​ ​valued​ ​at​ ​$20,​ ​$50​ ​or​ ​$100.​ ​Reward​ ​is​ ​valid​ ​only​ ​on the​ ​day​ ​it​ ​is​ ​awarded. 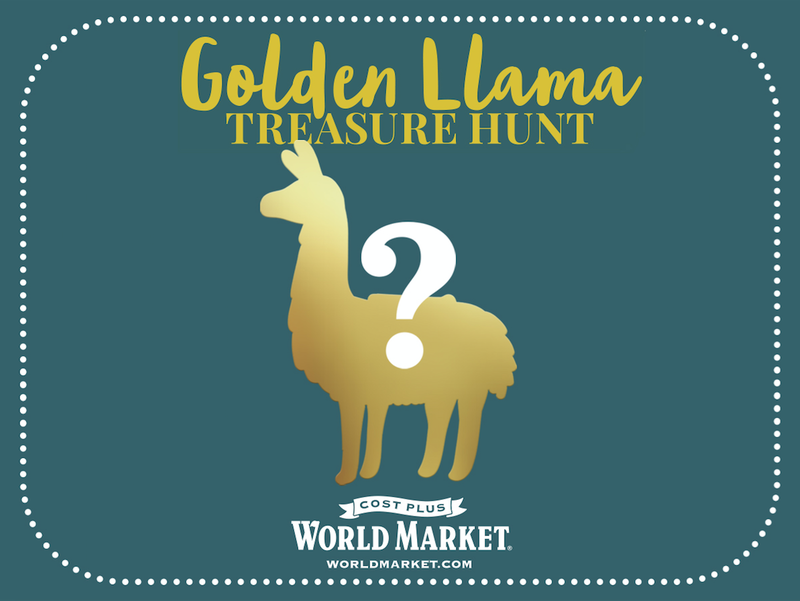 As you know I am a World Market Tribe Member/Blogger Brand Ambassador, which means I get the chance to post clues as to where to find the Golden Llama on my social channels DAILY through November 22nd. So be sure you are already following Ascending Butterfly on Twitter and Facebook where I will be sharing the clues, today's clue will also be posted in this blog post! I am all about the Holiday Llama-Rama at Cost Plus World Market right now and between the Llama Ornaments, Llama Lamp, Llama Art/Llama Pictures, and even a cute Stuffed Llama there is a little Llama love for pretty much everyone on your list, and check out my slideshow below to see some of the Llama items on my holiday wish list! Leave it to me to find the perfect gift for the Llama lover who also loves Wine. Ahem, like ME!!!! And don't forget the Llama Llama Holiday Drama Picture Book. I need to fill that "Save the Drama For Your Llama" mug with hot chocolate (ok so it might be spiked with something, don't judge me!) and fill out those Holiday Llama Cards, hang that cute stocking, then put on that super cute Gray Cable Knit Llama Scarf and hit my nearest Cost Plus World Market to find the Golden Llama, and then come home to a glass of wine with my Wine Charm on it, and take a long bath using that Gingerbread Soap while perusing the picture book! 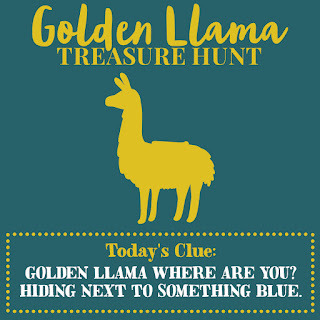 Above: Golden Llama Treasure Hunt Clue #1: "Golden Llama Where Are You? Hiding Next To Something Blue." Don't you just love my Wish List slideshow? I think I am going to make one of these every year, and on my birthday, and on valentine's day too! I am going to go Llama crazy this holiday season, how can you resist any animal that looks like it is smiling/happy? I think it's why I also like Sloths, looking at them always makes me smile. And aren't the holidays all about surrounding yourself with things that make you smile? And because I know many of you will ask, NO, I do NOT know where the Llama is hiding, I have the clues my butterflies, but you need to hunt for it to get the reward. FTC Disclosure: This is a sponsored post. All opinions are 100% my own! This post also contains affiliate links) I am disclosing this in accordance with the Federal Trade Commission 16 CFR, Part 255 - Guides Concerning the use of endorsements and testimonials in advertising, you may check our Giveaway and Disclosure Page for additional information regarding Ascending Butterfly Disclosure. How fun is this??? My closest Cost Plus is an hour away, so I don't think I can play, but that would be so much fun to do!!! This is one of the more fun giveaways I've seen. I'll have to enter this. Thanks! @Stacie Agreed! I think this is such a fun way to shake up routine holiday shopping and add a bit of excitement! I have to show this to my wife. She's the shopper in the house, and this is perfect for her. Awesome giveaway. I love this! World Market is my go to, I love their Paramus location! @Mitch I haven't yet visited the Paramus location. The only thing I know about NJ is Atlantic City which has been my happy place for years now. I hope they open a location at the outlet shops district of AC so I can combine my love of gaming vacations with my fave place to shop! Great giveaway! I'm not sure if there's a Cost Plus nearby. I'll have to check that out. The treasure hunt is a really cool opportunity. Finding one of the golden llamas and winning a prize would be great. I think there is a World Market in New Jersey but it's still very far away. One day I will get to make a trip there! This sounds like a fun treasure hunt! I've never done anything like that before but it would be cool to check it out. I am not familiar with World Market either but it sounds like a great place to shop! This is so fun. I really like shopping at World Market and I love the chance to win. @Pam Don't forget I will be tweeting clues DAILY until 11/22 at 10 am Eastern Standard Time! I love Llama!!! Sorry I had to get that out. I think it is Alpaca I really love more but whatever lol this sounds like a really fun event! What a fun treasure hunt! I love World Market! A treasure hunt while shopping? Never done that before but sure looks like fun! I will have to find out where the nearest World Market is! I must visit! My daughter's dorm is in East Village and I will be there for Thanksgiving! Thanks, as I wasn't aware of this store. @Myrah YAY! I am glad to hear that you will be in city for Thanksgiving! In and out or staying for a few days? It isn't far from the dorms, or if you will be visiting Brooklyn you could also easily do that location as well. This is a really great promotional idea. People could learn from this! @Sara I think it is super smart to use a savvy digital campaign to drive traffic to their brick and mortar locations. I personally love online shopping for quick comparisons particularly price and to read product reviews, but I get most inspired, particularly when it comes to home and room redecorating projects by visiting the stores for ideas, inspiration and decorative touches. It's so cool that you get to win while you have fun finding that golden Llama! What an awesome concept. I live too far to participate in this awesome treasure hunt. I wish I lived closer, I'd love to join and have the chance to possibly win a prize. Oh well, I wish every one the best of luck! That's pretty awesome and it's going to be so much fun as well. I'm sure you'll get what you want on that wish list! 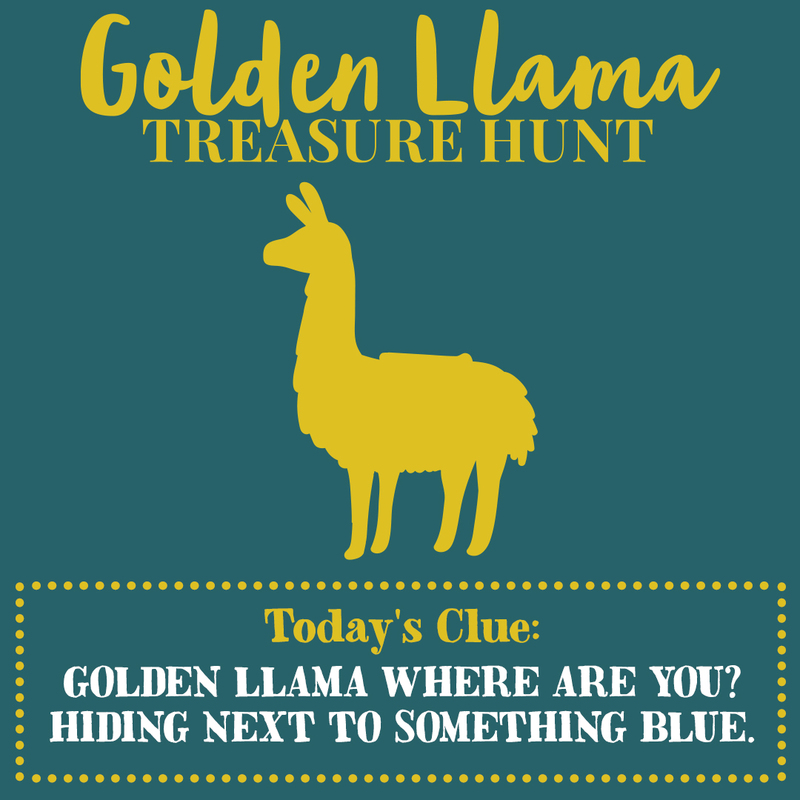 How fun is it hunt for that Golden Llama! I'm sure a lot of people will enjoy this one. @Jocelyn This is the most unique in store scavenger hunt I have played to date! Seriously, how fun is this hunt! I think it's awesome that you can win a range of prizes. It's definitely worth joining. These giveaways are awesome and fun! I have to share it to friends and hope to win together! @Ruth Please tag us via twitter when you hit your local store @Ascending1 and don't forget to tag @worldmarket too! I wish I lived near one of these! That sounds like such a fun giveaway! @Wendy It felt like forever before our area got one, but it was so worth the wait! Hopefully if you are traveling during the holidays there will be one near your destination. This is such a fun idea! I have always had a thing for llamas too, ha! @Marissa Aren't they sweet looking? Hope you get to pick up a few at World Market for the holidays. I adore Cost Plus World Market! There are always such unique gift and food items. I'll be on the hunt for the golden llama! @Crystal I will be tweeting clues everyday from my @Tracy_Iglesias twitter account! These are so awesome, I love treasure hunts especially if I get a good reward. I'll be going "shopping" during the week when I'm in Brooklyn! This sounds like such fun! I wish I lived near a World Market! @Cyn Hopefully if you are visiting friends and families for the holidays there will be one near where you might be visiting? Wow. What a great way to run a contest. Scavenger hunt and shopping all in one! Im a huge fan of World Market. This is also a great giveaway! 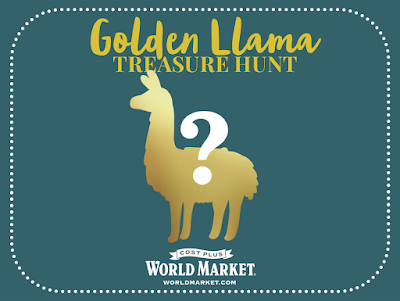 @Kiwi Glad to hear you are a fan of World Market, hope you find the Golden Llama at a store near you! I have never heard of it. Sounds interesting. Should be giving it a try. Thanks for sharing. This is such a fun idea. Dangerous for me but fun! My sister and I actually have this inside joke about llamas. Long story short I bought her a llama from World Market one Christmas. Funny how now they have a llama hunt. For sure going to participate. @Seeking Neverland - That's awesome, I hope you and your sister participate and win! That is a cool wishlist slideshow. And what a fun way to earn coupons. Thanks @Aduke - I think I am making slideshow wishlists every year from now on! What a fun treasure hunt! I love shopping at World Market so this is really exciting. Thanks for this. Have fun @Lyndee and good luck! This sounds like an amazing opportunity! It sounds like there are so many things that you could really get into and enjoy.